On the afternoon of Sunday 6th December the 124th London Eza was held. As always upon entering Three Wheels we received a very warm welcome and were instantly made to feel comfortable and at ease. 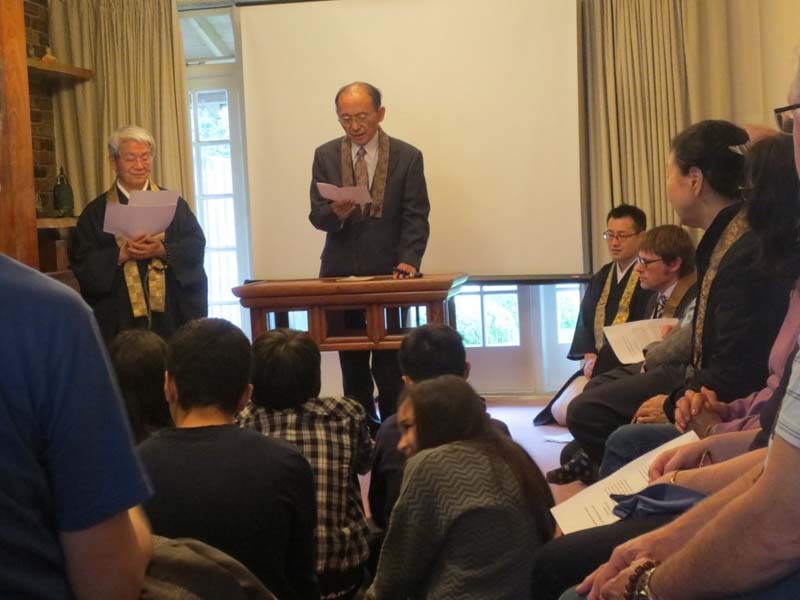 The service led by Reverend Kemmyo Sato and Reverend Kenshin Ishii was very strong and powerful, and created a very positive and harmonious atmosphere for the whole Eza. After the service Mr Andrew Webb once again warmly welcomed everyone to Three Wheels and introduced Reverend Kemmyo Sato who gave a talk on his recent visit to Japan. Reverend Sato said that the main purpose of his visit had been to interpret a talk given by Professor John White while in Kagoshima. This was one of a series of recent big events to commemorate 150 years since the first Japanese students had come to the U.K. and how they had been welcomed by Professor and Mrs Alexander William Williamson and taken care of with such loving kindness. Reverend Sato said how much he had enjoyed his stay at Shogyoji, and how impressed he was by the current conditions of the Sangha there, which he called the Sangha of peaceful awareness. He said that at Shogyoji each individual is aware of the reality of their karmic existence ( ki ) and also aware of Amidas unconditional love that embraces them ( ho ). Even though problems sometimes arise in the community, by returning to ki and ho they solve their own problems and encourage others to do also. Reverend Kemmyo Sato said that his master Venerable Chimyo Takehara, Head Priest of Shogyoji Temple, had told him how important it was to become aware of ki in the light of the Buddha Dharma. Mr Andrew Webb then read out a talk by Venerable Chimyo Takehara in response to two very important subjects brought up by Professor John White. He talked about the need for there to be encounters between the individual followers at Shogyoji, where the pure Shin Buddhist faith is practiced, and the Sangha at Sanrin Shoja, in order for the Buddha Dharma to flourish here in the U.K. He talked about the need for constantly renewed follower to follower contact, and that only through these encounters could true faith continue to flourish at Three Wheels. Precisely because of this that we were extremely lucky to have attending the Eza Mr Michiaki Konya, and his wife Toako, with the specific purpose of promoting spiritual exchange between Dharma friends in Japan and the U.K. The other subject was the translation into English of The Letters by Rennyo Shonin. These are read every morning and evening during service and are of fundamental importance in understanding the essentials of Shin Buddhism. It was in 1461 and at the age of 47, that Rennyo Shonin wrote the first of his many letters, and he would write many more until he was 84 years old. An English translation of these letters will be of vital importance and benefit to the Samgha in the U.K. and an event to be much anticipated. After Mr Andrew Webb had read read out Venerable Chimyo Takehara’s talk, Mr Michiaki Konya introduced himself. He is working as a receptionist at Shogyoji Temple office, sincerely greeting visitors and guests to the Temple. When Professor John White recently visited Shogyoji, Mr Konya was very impressed by his notion that it will be only through encounters between individual followers from Shogyoji and the U.K. that true faith will continue to flourish at Three Wheels. Later on Venerable Chimyo Takehara asked him who should go to Three Wheels and Mr Konya responded by saying that he would like to go. Mr Konya said that he was very much looking forward to encounter with as many people as possible during his stay in the U.K.
Mrs Toako Konya, who is Reverend Kemmyo Sato’s younger sister, then introduced herself. She said that because of Professor John White and Venerable Chimyo Takehara she was able to be at Three Wheels. She said she was so happy to be here and that she strongly wanted to have encounter with everyone. It was very humbling to meet two followers who are so sincere and who showed so much gratitude. It was easy to see the true faith that they had brought with them from Japan, and to remind us of how much Three Wheels owes to them and everyone at Shogyoji Temple. Afterwards some impressions were given by members of the Sangha all agreeing that it is only by contact with Shogyoji that Three Wheels can be a place to sincerely listen to the Buddha Dharma, and that it is vitally important to have that contact with true Shin Buddhism. Reverend Kenshin Ishii repeated these sentiments and spoke of his gratitude to Professor John White and Venerable Chimyo Takehara for making it possible to send Mr and Mrs Konya to be at Three Wheels. He talked about all the good advice and help he had received from them. Reverend Ishii then went on to show us two videos that were made at Shogyoji about Rennyo Shonin. They were in Japanese but English subtitles were translated by the students here at Three Wheels. It took a lot of hard work but finally, after Reverend Ishii and Mrs Kaori Punwani had explained more, they could fully understand and do the translation perfectly. Both the videos were very moving and brought a few tears to several eyes. Rennyo Shonin showed such warmth and understanding to his followers, as well as his great wisdom in helping others comprehend the Buddha Dharma. It made us think that when things are not going so well on the spiritual path, not to be too downhearted and just to trust in other power and Amida Buddha, and to say the Nembutsu. The honesty and sincerity of the characters was very humbling. After the videos many people made comments about them and how everyone had been very impressed by them. Reverend Kenshin Ishii then talked about the new Three Wheels website that is now up and running. This has been updated and modernised and is looking better than ever. He explained some of the new features that are available and of the addition of some more pages. To finish off Mr Andrew Webb told everyone about some upcoming events at Three Wheels which will be happening in the next few months. Then it was time to socialise and relax, with plenty of good food and drink, and with the special treat of the entertainments being laid on by the student members of the Sangha.